Welcome to the Rhody Survivalist! : As I began to compile information for a Wilderness Survival presentation I realized that there isn't really a place on-line where I can share all these great pictures, videos and information easily with people. So, I started this site so I could share with you the stuff that I think is important in regards to survival. Here in Rhode Island we have regular hurricanes, blizzards, cold snaps and heat waves. If you are ready to survive a long term disaster, the hurricanes and blizzards will seem like minor nuisances. To really be prepared you need to be ready to walk into the wilderness and live comfortably for months or even years. This is not as easy as it once was. Many of our natural resources have been depleted or contaminated. Just to name a few examples, the water today is laced with Giardia, the mighty Chestnut tree, once making up 1/4 of the hardwood population of this region is gone, and there is now an tick borne infectious disease called "Lyme Disease" which can be debilitating and lurks in nearly every vegetative patch of land. To make it worse, we are unpracticed and untested in the ways of the natural world. We all have a duty to prepare for the worst. If you are not prepared, you are part of the problem. When a truly major disaster hits, you don't want to be relying on the government to save you. Have a positive attitude. Attitude is the number one survival tool. You NEED to have a positive attitude regardless of what is going on around you. If you find yourself in a survival situation it is imperative that first you take a moment, check your attitude, and adjust it if necessary. 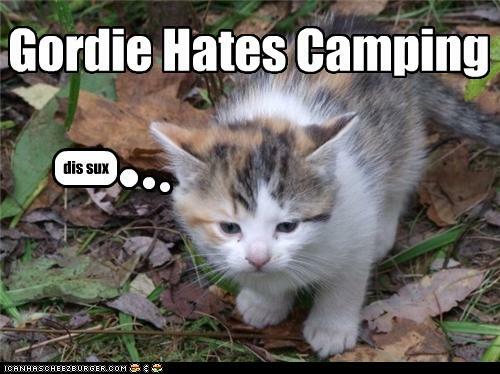 Good practice now is to go camping, get used to the uncomforts of living outdoors, and accept them. You will find that things that you used to find uncomfortable such as sleeping on the ground or being wet all day in the rain suddenly become energizing and invigorating. It is amazing what happens when you wake up your native mind. Remember: Attitude is Everything: Skill is Secondary. Gordie works on his "Attitude"
For me a pursuit of survival skills is more about fun and feeling that connection with nature that has become so detached in our modern lives. Most people however don't really see anything "fun" about this. I wrote most of the below section prior to a survival trip that really opened my eyes. When I looked at the impacts of just a few people on the landscape in a survival situation I realized that hordes of people heading to the woods and attemting survival is just not possible. We humans use a lot of energy, even when sitting still we consume the power of a 40W lightbulb or more! To feed the human machine we require fats, sugars, starches, and protiens...... mostly fats. All of these things are quite rare in nature. What I am getting at is that the wilderness cannot support the number of people who whould be heading out to "survive" in a real SHTF scenario. Even people who are trained would have a real hard time finding the resources they need. I almost think that in a real Hollywood movie disaster most of us would be better off staying at home and doing the best we can. I would reccomend that everyone have about 6 months of provisions on hand. Just be aware that your neighbors don't plan like you do. Are you going to defend your supplies? Hopefully, if this scenario ever plays out we all tighten our belts, treat each other neighborly and try to get along the best we can. History is full of examples of humans doing just that. History also tells us that the alternative could be Humans acting like our DNA wants us too: "Survival of the Fittest"...to the detriment of all. During the Great Depression wildlife almost dissapeared from the American landscape. In some parts of the world it never came back. Furthermore, wild meats are very low in the one thing we really need.... fat! It would not take long for humans to decimate wildlife populations. So, please read the below section with a grain of salt and remember that it would be good for a localized or regional disaster but in a real SHTF zombie Hollywood scenario you may be better off in your house with some supplies and some shelter rather than stuck in traffic on a road to the mountains with a bunch of jittery nutjobs. Oh,....and while I'm on this topic, everyone wants to carry a big gun with them for protection. No matter what, you will run into people with bigger guns. Remember that ammo is made out of brass and lead, neither of which is light. The smartest thing you can carry is probably a .22 rifle. You can carry loads of ammo, it doesn't weight too much and if you are good with it, you can be rather lethal. You aren't going rabbit or dear hunting with your .45 or 9mm handgun so leave that heavy stuff at home. I would prefer to get into a gunfight with me and my rifle at a distance from the guys with the handguns. Trust me, getting shot with a .22 is still getting shot. If S ever does HTF you won't be able to carry enough firepower anyway. Let all the gun guys go at it with each other and head the other way. Finally all those crazy looking zombie knives you see out there for sale are just dumb. If you want a tactical knife stick with the stuff the military uses. They know a few things about tactical pointy things. If you want a bushcraft knife (you should) then see my tools page. There are lots of stupid knives out there and most of them are low quality and some of these are very expensive. The worst case you reasonably need to be prepared for is a "Progression to Primitive" over a course of ten years. In other words, as time goes on you will gradually shed the crutches of the modern world and become proficient with the ancient forgotten skills of our ancestors. Initially, this involves having a "ditch bag". Your ditch bag contains everything you need to make the progression comfortably and safely so you can shed items as you no longer need them. Your ditch bag should go everywhere with you. It will keep you safe if you are stranded in your car in a blizzard and it will keep you safe if you decide to take it backpacking in the wilderness for an extended survival camp. Modern man cannot be expected to walk into the wilderness prepared to live the way our ancestors once did, at least not right away. A slower progression will increase your chances of survival and decrease the stresses of making the adaptation. A good example is this: If you don't know the basics of fire building how can you ever be successful with a bow drill? Also, the first two weeks after a disaster will most likely be critical. Having the supplies available to make it through the first two weeks will give you time to get your skills ready for the next year and so on. Table: Progression to Primitive in 2 Years. 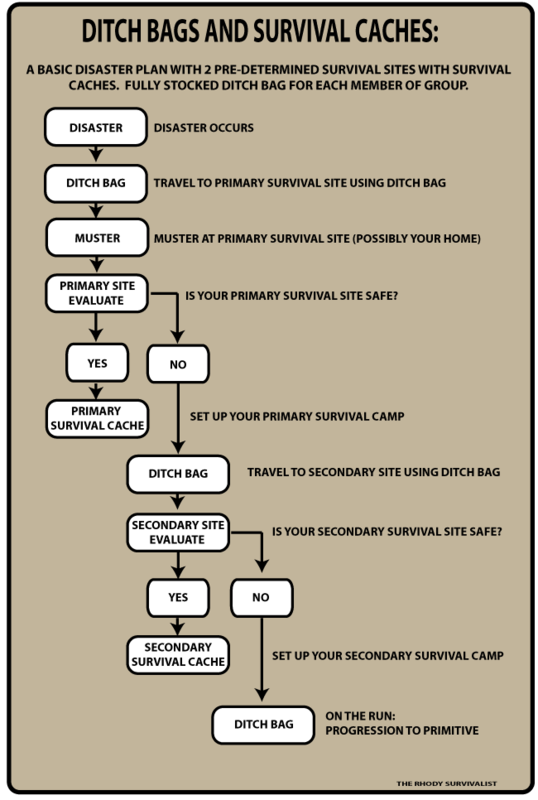 The Ditch bag is the most important component of this survival system. It will enable you to not just save yourself but help others less prepared than you. The ditch bag needs to be small and light or else it won't be convenient to carry around. You should use your ditch bag often to get familiar with its consists and make changes where needed. Backpacking and taking survival trips with just your ditch bag is an excellent way to test your equipment and hone your own skills. Remember, after 2 years the ditch bag is gone and you have made the progression to primitive. The ditch bag is just a temporary means to get you there. Below are some suggestions of things you may want to stow in your ditch bag. Two versions a "ditch bag" and a "ditch bag light". What is interesting is when I ask seasoned survivalists what items the would carry at an ABSOLUTE MINIMUM the resonse is always the same: 1. A Good Knife. 2. A Small Metal Pot. 3. A Lighter. 4. Some Cordage.